When asked what your favorite city in the world is, what would you say? Where have you been that you instantly fell in love with? A place that has a feeling like nowhere else? Luang Prabang had been high my agenda even before I decided to undertake this adventure. 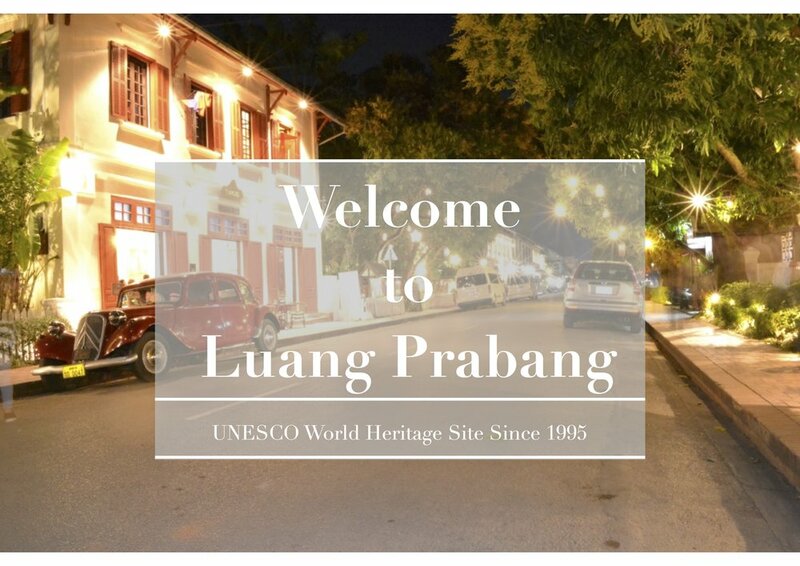 As a UNESCO World Heritage City in the heart of Laos and with the like’s of Lonely Planet whimsically quoting “Luang Prabang slows your pulse and awakens your imagination with it’s combination of world-class comfort and spiritual nourishment”, who wouldn’t be intrigued by the sound of this place. Over the last 300km especially, Laos had provided some of the most incredible scenery and experiences. From hiking to a stunning viewpoint on Pha Ngeun Vang Vieng, climbing deep into the indescribably big cave of Tham Phu Kham, also Vang Vieng, to cycling and staying in the government warned, machine gun wielding rebel strongholds in Phou Khoun and cycling the equivalent of a 1/3 of Everest in one day. One thing that makes it all pretty special and unique, is that it’s all done by bicycle, alone, with 35kg of my belongings strapped to my bike. Cycling uphill for 50km’s with +14% gradients at times, through Laos’ mountain hill tribe villages, is a special, unique and very challenging experience and takes this experience to new echelons. When arriving in Luang Prabang for the first time, having come from Vang Vieng and Vientiane and already cycled 400km’s of Laos, it felt new, like I’d been unconsciously searching for a piece of treasure and I’d just found it. I could already feel how special this place. I arrived in Luang Prabang about lunchtime after a nice and easy 30km ride from Xiang Ngeun, so the first stop was to grab some lunch. Having spent the past 7 day’s in the mountains with fairly basic food offerings, I couldn’t resist some western food when the opportunity presented itself. I’d left Surly on the side of the road leaning against a wall and as I sat looking out, I noticed lots of people admiring her. One American guy in particular called John, with long white hair and a handle bar mustache that would make Hulk Hogan look twice, took an interest just as I was about to leave for my guest house. “How much does it weigh?” he asked. “I’m carrying about 37kg”. We carried on talking and it turns out John lived in Vietnam and was here on holiday. “Haha, nope” he said finitely and pointed me in the direction of the bridge I needed to take. As I was setting off for my guest house, a procession turned the corner just ahead of me, with monks adorned in robes and the vehichle dressed in what looked like traditional ornaments, statues and textiles, with ceremonial music playing into the air and flames lit on torches. “Wow, cool.” I thought, reaching to grab my phone to capture some of this moment. I’m filming away and as the procession passes me, I soon realize, much to my embarassement and seeming lack of respect, that it was in-fact a funeral, causing me to quickly whip my phone into my pocket. Having done my research on accommodation in Luang Prabang, I decided on Phone Praseuth Guest House which is on the ‘other-side’ of the Nam Khan river and across the famous ‘bamboo bridge’ of Luang Prabang. The bamboo bridge is a pedestrian bridge that is only used for 6 months of the year as during rainy season the water rises above the bridge and washes it away so it has to be re-built. There is a separate bridge for motorcycles and cyclists and another for cars a little further away, so I took the designated bike route. This would become my regular route in and out of the central part of town, as it was for lots and lots of other which proved treacherous at times. Surly Temple and I had crossed the river for the first time and 3 minutes later we arrived at Phone Praseuth guest house, where we were welcomed by incredibly enthusiastic, helpful and friendly staff. Phone Praseuth guest house, 346, unit 7, Ban Phan Luang, Luang Prabang, Laos is a family run guest house set on the quieter side of the Nham Khan river, and in a perfect location with a short 10 minute walk into the centre of town across the bamboo bridge. On arrival, I met an older French gentleman called Richard who was traveling with his wife. Richard seemed like a very interesting man and we spoke for a short while until his wife ushered him off and so we wished each other “Bon Chance’. The rooms at Phone Praseuth are very clean and comfortable with varnished teak interior providing a natural feel with all the mod cons needed for a comfortable stay. I unloaded Surly Temple, got all my stuff together and took my dirty clothes to reception to be washed, which is always a criteria consideration when looking at places to stay after a good few days on the road. After a tepid shower, I was ready to get out and explore and experience the bamboo bridge for the first time. When you spend a day here, you realize you’ve walked in to part of Earth that is very deserving of your time. There’s a tranquility unlike anywhere I’ve visited before; a serene sense of understated beauty and respect for heritage. With food and accommodation options for every budget, from the basic up to luxury, and evening street markets providing cheap and tasty food options along with higher end restaurants and bakeries strewn along the high street quenching your sweet tooth and caffeine needs, Luang Prabang offers something for all. The café’s are evidence of the French colonialists of the early twentieth century and are great places to spend an hour watching the world go by. There is certainly no shortage of restaurants for breakfast, lunch or dinner in Luang Prabang either. Laotian, French, Italian, Indian, Mexican, there is something different for every day of the week if you wanted. 1. Tamarind, Lao Cuisine. $$$. Although I didn't eat there, Tamarind seemed to be one of the most popular and traditional Lao restaurants. I did the cookery class and if it is anything to go by, it would be a lovely meal. 5. Phonheuang cafe, Lao Cuisine. $. A great 'little; restaurant 2 doors down from the Garavek theater. Big portion's, small bill. 6. Elephant, French Cuisine. $$$$. I didn't actually eat here as it was a tad out of my budget having bankrupted myself on physio in Vientiane, but the menu looked excellent. A typical French 'Fine Dining' restuarant. There's plenty more restaurants in Luang Prabang, with the Nam Khan riverside offering a great selection of quiet and formal restaurants. My first day in Luang Prabang was great and you soon become familiar with the town and your bearings. I walked around for a few hours, elated still from the past weeks riding and excited to be in one of the worlds UNESCO Heritage Sites. I spent some time walking around the grounds of a Wat, where the sound of chanting monks filled the air and the sense of place really set in. I stood there for a while, just listening and starring at the temple, meditating almost, but feeling strong, proud and somewhat enlightened. If you’d asked me on the 3rd January 2017 where I’d be in January 2018!? “standing in the middle of Luang Prabang, Laos, listening to chanting monks, having cycled 1500km” would have seemed a ridiculous thing to think. If you’d asked me on the 5th January 2017, I’d have offered a sinister “who knows”. Ask me where I’ll be in January 2019 and I’ll simply offer this “ we’ll see”, much like the story of the Zen Farmer. One thing's for sure, re-writing my story makes me incredibly excited for the rest of my life and the people I choose to have in it, and the paths of others I’ve yet to cross. On leaving the grounds of the Wat, I happened across a small food stall with a delicious smell gracing my nostrils! “My friend you must try. Takoyaki, Japanese tapas, you know?” asked the beaming chef behind the stall. “I don’t, but I’m about to try it” I quipped. These little balls of egg, octopus, spring onion, coriander, sticky rice powder, chicken stock, rice cracker crumb and ginger were served with a tonkat sauce and the combination was absolutely delicious. A slight crispiness on the outside and a soft egg, octopus and herb filling in the middle that offers a peculiar texture to start with but is soon followed by the subtle blend of flavour’s that don’t really sing together on paper, but strangely harmonize in flavor. After a my quick and delicious introduction to Takoyaki and with the sun starting to lower in the sky, it was that time; beer o’clock, and where better to sip on a cold beer and watch the bright red orb descend onto the other-side of earth, than on the banks of The Mekong River in a UNESCO World Heritage City. Sa sa sunset cruise and bar sits right on the banks and as the name indicates, offers cruises along the Mekong. After a beer or two, I was feeling on top of the world; unconquerable almost. I shared the little knowledge I knew and the things I had planned, and the conversation continued. Lorenz, Rens and Eva had met a week or 2 before and had continued traveling together which seems to be quite a common thing amongst travelers. Renz and Eva are brother and sister and Eva was over for a few weeks from Germany to see Rens who is traveling longer term. Lorenz is Dutch and traveling solo around Southeast Asia also. We continued chatting and as they paid their bill, they asked if I’d like to walk the market and grab some food with them. So the four of us set off and walked the busy night market full of local handcrafted textiles, woodcraft, art, colour and Lao Lao. Phosi market bursts to life of an evening and fills the main high street with sellers and buyers going head to head, buying and selling with the barter common place. It’s a wonderful place to walk of an evening with a great ambiance and plenty of visuals. Lao Loa is a locally produced, 50% rice whiskey and along the markets you’ll find all sorts of creepy crawlies mixed in with this potent drink. Snakes, giant centipedes, scorpions and more. It would have been rude not to so Lorenz, Rens and myself duly obliged. As well as the handcrafts and textiles, the street is laden with small street food stall’s selling everything from whole grilled fish to rice powder coconut pancakes. With the market walked and the Lao Lao sampled, my 3 new friends and I made our way to Utopia, a hidden bar and restaurant in the back streets of Luang Prabang. It’s one of those places that if you weren’t looking for it, you’d never find it, and as the name suggests, it is an incredibly laid back and tranquil place, if a little crowded with ‘farang’. It’s here I am introduced to Captain Jack, a Dutch cyclist who was staying in the same hostel as my new friends. Jack is in his mid to late 40’s and is a seasoned bike traveler with a great sense of humor, so it was great to chat all things bike and experiences for a while. Jack doesn’t drink alcohol, so was cool to see him just indulged in a few rich smoothies. “As I don't drink, I treat myself to smoothies. My two vices; smoking and smoothies” he confessed, which I found funny. After a few drinks and some great conversation getting to know each other and sharing stories, we all said good night, but I knew it wasn’t going to be the last time I saw these guys. We shared Instagram, pages which has now become my mode of communication with fellow travelers and is a great, unobtrusive way of keeping up with people’s travels. You might be surprised to hear that there is a midnight curfew in Laos, with bars closing at 11pm and ‘farang’ expect to adhere to this also. The reason for this, as is my understanding, is so that the local people can rise early enough to offers alms to the monks. 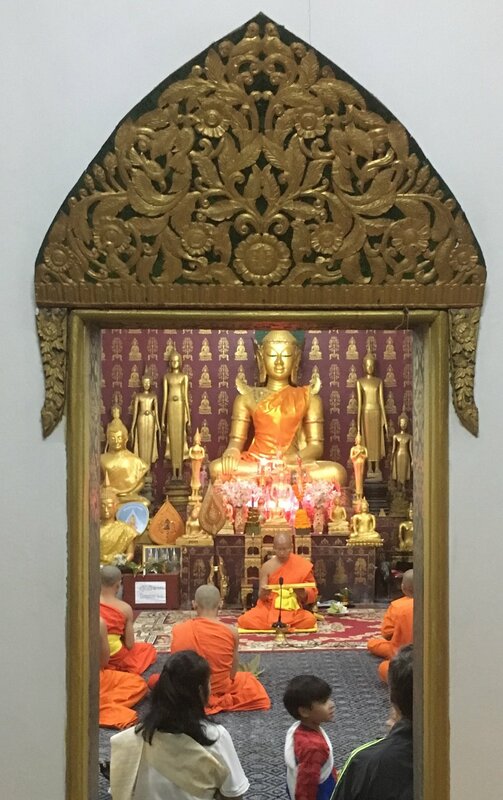 The giving of ‘Alms’ or “TAK BAT”, is a daily, early morning ritual and one of the most common of practices among Buddhist monks and other religions for that matter. From before the break of dawn, monks descend on the streets, in single file with typically the eldest leading on their alms round. As one of the oldest and most common rituals, food is given to the monks during alms rounds and is also ritually offered to tantric deities and hungry ghosts. Offering food is a meritorious act that also reminds us not to be greedy or selfish. It was now late and past my curfew, but just before crossing the bamboo bridge, I noticed a small wine and cocktail bar called Icon Club was still open. Lisa from Hungary is the owner of this quaint little Parisian esque bar and has lived in Luang Prabang since 2001. With cocktail glasses hanging above the varnished wood bar and a retro feel, it’s the kind of place you listen to jazz, sip on carafes of red wine and tell someone your life story, and that’s exactly what happened, sans the carafes of wine. At the bar, I got talking to Morgan who was traveling with his girlfriend, and had been to Luang Prabang 7 years ago. Turns out Morgan is a psychologist from Australia on holiday for a few weeks. The conversation got deep quite quickly, with me explaining that I’d been seeing a psychologist back in the UK, my experience of it and why, in hindsight, that investment of money and time might have had the best ROI of all. In my opinion, investing in your self is the best investment one can make and my decision to challenge myself beyond anything I’ve ever know on this adventure, bar last year, has been the best decision of my life. Morgan opened up about his own personal life experiences and although both intoxicated, it was great to get deep and connect on that level with someone of that mind and in that location. Morgan, if you are reading, great to meet and chat buddy. Contending with the wobbly bamboo bridge in the light is a fun experience, but walking it in the pitch black, with the water rushing 25 feet below you is an exciting experience, that I would have struggle with a short while ago. Although small, it would be easy to miss so much detail in the main part of Luang Prabang. With a ring road following the water’s edge the entire way around and past the confluence of the Mekong and the Nam Khan, it’s the small streets in between that offer more of an authentic Luang Prabang, with The Old City offering the highest concentration of monasteries and old buildings, but little in the way of ‘shops’. After cycling around all morning and taking in this breath taking city, in awe of it’s tranquillity, I chose to have lunch at a very small, local, back street restaurant in the Old City, which only offered 6 things on the menu. Richard and his wife Muriel, the French couple I met when I first arrived at my guesthouse soon appeared in-front of me, looking at the restaurant also. “Bonjour” I said, with Richard looking over with a slight delayed reaction as to who I was. For the next hour or so, the three of us sat and had lunch together, with Richard providing the most interesting of stories. Having asked Richard what he did for a living, he explained that he was a cinematographer and created ethnology documentaries, one called “God Is American”, about tribes and cultures in Tanna Island, Vanuatu, a South Pacific Ocean nation made up of roughly 80 islands that stretch 1,300 kilometres. Richard explained that he spent 6 months with the tribe and strongly suggested that I should visit there, reiterating how much I would enjoy it, having heard about my adventure. Although I’d already eaten, Richard and Muriel offered me some of their food, one thing in particular was Kaipen a traditional Luang Prabang snack of seaweed/ algae, that is dried and deep fried with sesame seeds. Lunch was great and Richard and I got on very well, so much so that Richard asked for a photo of me as he was leaving and obviously I had to reciprocate, which I’d wanted to anyway. That evening, and following the subject of cinematography, I went to a free open air cinema at an upmarket hotel on the Mekong side of the town. ‘Chang’ is a silent film, filmed in 1925, about a poor Laos farming family in Nan Province (Norther Thailand on the Laos border) and his daily struggle for survival in the jungle. Directed by the directors of the original King Kong movie, Chang, meaning elephant in Thai, is one of the first documentaries of history of cinema, and the first film to document life in the Southeast Asian jungle. Traditional Loatian music was added in the early 2000’s. It was interesting and fun and a nice thing to see if visiting Luang Prabang. One place I did find my self spending sometime in, was a café and restaurant called Big tree café and I found myself here the next morning after a casual ride around town on Surly temple. I don’t know what it was that drew me to this place but it seemed to be my go to place to write, away from the main hustle and bustle of the center of town, and with a view over looking the Mekong, it was a cool place. Upstairs had a photo gallery of photos of the local Lao people and was great just to sit amongst it and write, sipping coffee and tea for a few hours. I’d seen signs for ‘Story Telling” at the Gravalek theater, accompanied by live local folk music, on one of the back streets in the Old City, so I had booked that for evening. Lorenz, Jack and Eva had also booked it. I met Jack out the front with Surly Temple and he’d brought his bike as well, having been riding around town a bit earlier. As we are waiting for the others to arrive, an old, short man with few teeth and wearing traditional attire approached us carrying a traditional instrument and started playing traditional, Laotian folk music, which was cool. I gathered that he was the musician, not just a random guy, but he seemed very happy as he gate us a huge, toothless grin and laugh after he finished. The traditional folklore ‘Story Telling’ was interesting and fun, but some what lost on me. I can see why people would enjoy it and why it has been highly rated on tripadvisor, I just didn't connect with it for some reason. At £4.30, or 50,000kip, it was still a nice experiences and I’m still glad I went. As we all left the theatre, we were graced with the start of one of the most incredible experiences of my life. A ‘super blue blood moon’ is a spectacle of the nigh sky, and this was the first total lunar eclipse since 2015 and the first blue blood moon visible from the U.S since 1866, which I found fascinating. As a keen stargazer, it is always a pleasure to witness these rare occasions, but doing it in Luang Prabang, of all places in the world is quite idyllic. I was asked to join for dinner, so we start to walk towards our first choice restaurant. After a short 150m walk up to the main street, the ceremonial sound of a banging gong and symbol caught our attention. Whether because of the Eclipse, or because it was the last day of the month, I’m not sure, but in this already incredible moment, we happened across a Buddhist ceremony in a nearby Wat. With a monk banging a large, 6 foot hanging barrel drum and another chiming in with symbols, and with a Super Blue Blood Moon glowing red in the sky, I got completely lost within myself in one of the most incredible experiences of my life, which left me absolutely glowing inside. It was a true ‘sense of place and sense of self’ moment. Our first choice restaurant, Tamarind, know as one of the best Laotian restaurants in town, was fully booked, but fortunately I had a cookery class booked there the following day, so on Jack’s recommendation, Jack, Lorenz and myself, headed to Khaiphane restaurant with Rens and Eva not feeling well. Khaiphane restaurant is part of TREE, a global alliance of 7 training restaurants in Cambodia and Laos. They are social businesses with an ultimate goal of providing young people, many of them former street youth, with the skills they need to become employable in the thriving hospitality industry. The food was outstanding; Jack had the pan fried duck breast with tamarind sauce with Lorenz and I both going for the Laksa, a spicy noodle soup, which both looked great and the Laksa really delicious. We all went for the same desert which which as very interesting coconut panacotta, with rice crispies, candied chilli and mango which was also delicious. I’d fancied a glass of red for a while and whilst Jack doesn’t drink, Lorenz also fancied some, so we shared a really great bottle of Argentine Malbec, which hit the spot. All in all, whilst a bit pokey in price, it’s certainly worth it and I’d definitely eat there again and certainly with the same company. With a quick nightcap at utopia bar, I jumped on Surly Temple and glided towards the motorbike bridge. A quarter of the way across the bridge, which see’s hundreds, possibly thousands of motorbikes speeding across it ever day, I witness 2 separate crashes with mopeds and riders going flying. I helped one guy and his motorbike to his feet then carried on riding on. Another incredible and memorable night in the life of Andy ETC. Lorenz is currently a film production student and is traveling with a drone, so the day before I’d asked him if he’d be happy to film some footage in the middle of Luang Prabang, to which he agreed, so the following morning, we met in the centre of Luang Prabang, had a coffee and started filming the footage. No easy feat. After a few attempts and with some good footage, we decided to call it a day as I had a cookery class at Tamarind at 4.15 and we had had a few close calls with various obstacles and people.Before filming, we got talking to a team of cinematographers who were in Southeast Asia filming UNESCO World Heritage sites and had some serious kit with them, which was very cool. As we are packing away, I hear, “Dude, it’s a Surly” from behind me, to which I turned to see two long haired ‘dudes’ standing there. We got talking and introduced ourselves with a bit of bike chat. Mike and Christian look like they came straight off the set of ‘Point Break’, but live on a small island in Alaska called Wrangell, and work as adventure guides. We connected on Instagram and said we’d catch up for a beer and talk routes as they were heading a similar route to me. That afternoon and into the evening was all about Laos food at Tamarind Cooking School. With great reviews both at the cooking school and in their restaurant, I was looking forward to learning a few things. At 4.15 I arrived at Tamarind restaurant where the rest of the class and I took a truck 20 minutes outside of the main town, on what may have been the bumpiest road ever. On arrival, one thing you notice is the silence but for the flowing of water in the background. Tamarind cooking course is set amongst a flowing river below and still lily ponds all around. The simple, open-sided pavilions adorned with small clay bbq ovens and wooden chopping boards, really sets the scene. We were given an apron and introduced to our chef for the evening who’s name was Sit, who had a great sense of humour and seemed to know his stuff. Sit explained the dishes we’d be making, with all the ingredients laid out in front of him. Having cooked some delicious food, it was time to enjoy the fruits of our labour. As we are all tucking in, mmms, and oooh’s permeated across the long table, and I start on the tilapia fish parcels, which offer an incredible smell when opening the parcels and is absolutely delicious and fun. The third mouthful however, I find my self sat at a table with 12 strangers, with a fish bone stuck in my throat. This can often be an embarrassing and off-putting spectacle at the dining table, so instead of putting everyone off their food with my wreching and coughing, I subtly, without saying anything, stood up, grabbed my glass of water and took my self off to the toilet where I continued to stick my fingers down my throat and try and dislodge the little sucker, which was unpleasant to say the least. Fishbone dislodged and eyes watering, I made my way back to the table to finish the delicious meal we’d just cooked. With a successful cooking course ticked off and feeling great, It was time to see Lorenz and Jack for a beer, before they headed off the next day on the slow boat to Chiang Mai. It had been great to spend time with these great guys in Luang Prabang and maybe our paths will cross again one day. Lorenz, Jack, Rens and Eva, it was a pleasure. My time in Luang Prabang was coming to an end, so it was time to start focussing on the next leg of the adventure and preparing. Having overstayed in Vientiane by some 1.5 weeks due to injury, I needed to extend my visaby a few days, so that was the first port of call for the day. The VISA office is at the Provincial Police Station and is a very simple process. It’s a very reasonable $2 per day extension and $2 admin fee with collection the following day. Having extended my visa, it was on to Tiger Trail Bike Shop, a great local bike shop offering rentals and bike repairs. I’d wanted to give Surly Temple some TLC and at £8.50, or 100,000kip, she had the equivalent of a spa treatment. With some chores ticked off, it was time for some lunch. Dyen Sabai a restaurant across the bamboo bridge from town, which I’d walked past every day, and despite the wafts of nostril pleasing smells each time, I’d yet to sample it’s offering. On my way there I bumped into Mike and Christian again, who mentioned they were going for an Indian with a group of people, and whether I’d like to join. “That’s funny” I said, “ I fancied a curry tonight!” Turns out they were going to the same place too. So with lunch immanent and dinner planned, I made my way across the bamboo bridge once again. Dyen Sabai restaurant sits on the banks of the Nam Khan river and over looks the bamboo bridge. The restaurant layout is very cool and with a predominantly Laotian menu, it’s a great place to sample some good Laotian food with a view. I went for the fresh spring rolls and green curry with sticky rice, which was pretty exceptional and served in a clay pot, adding authenticity and a challenge element, in trying to get the last few drops of sauce out of the bottom. The afternoon was spent blogging and planning routes over a few more beers. I’d enjoyed every minute of Luang Prabang, and whilst I will miss it, I was excited to get back on Surly Temple and explore more of this awesome country. I know I will return again one day and who knows, maybe it’ll be with my wife and kids. The evening came around quickly and I was soon sat at Nisha restaurant, with a whole new group of people from Mike and Christians hostel. It’s amazing how quickly you move between people when traveling; creating friendships along the way, some lasting and some just in passing. The curry was pretty good and of the 12 of us, I think 8 of us had tikka mossala in a case of, “go with what you know”. I sat next to Ruby and Anna, otherwise known as Rubanna on Instagram. They are two friends traveling together. Anna from Austria but live’s in the UK and Ruby from UK, who met at Exeter university. The following day was my last before setting off on another tough part of the journey and into Vietnam so I had to stock up on essentials. Essentials mainly consisting of sustenance in the form of nuts and oreos. The afternoon was spent blogging and route planning in ‘Tea and Books’ a very quiet, peaceful café, where you have to take your shoes off when going upstairs, like you have to do in so many places and especially homes in Southeast Asia. The ‘Tea and books’ building was a varnished red wood building inside and out, which offered a real ‘Feng Shui’ atmosphere upstairs. I met Rubanna there quickly as they were leaving that afternoon, and I had something to give to them. During our conversation, Anna asked “ Do you know Felsted?” to my surprise. “I though as you were from Essex you might know it?” she said. “Oh my god, so did I” she replied. So in the middle of Laos, in Luang Prabang, I meet an Austrian girl who went to the same school as me, another sure sign of just how small the world is. Mike and Christian had left the day before and were heading north, and we had vaguely planned to meet up further down the road and potentially grab the boat from Mong Ngoi – Muang Khua, so when the following morning came around, it was time to set off for the North of Laos and towards the Vietnamese border, which provoked and excitement in me for the next part of this adventure. Having spent the past 10 days in Luang Prabang, meeting some incredible people and witnessing some incredible experiences, it was now time to say goodbye. I think I can confidently say that Luang Prabang has touched a part of me unlike many places in the world. With its beauty, charm, tranquility, architecture and amour prope, its little wonder this ancient city boasts a UNESCO World Heritage City accolade.